Update: work from 8th April including new West Way crossing and temporary closure of access from Arthray Road to Elms Parade. Mace and SDC have provided an update newsletter covering work planned for the Easter school holidays in 2 areas. 1) With effect from 8 April (to coincide with the start of the school Easter holidays) we will again be closing the pedestrian walkway between Arthray Road and Elms Parade for a period of up to 4 weeks. This is to allow for the installation of services and service connections to the main services already installed. As before it will not be possible to open the path overnight. The alternative pedestrian route from Arthray Road to Elms Parade will be via Westminster Way and West Way. The route will be sign posted and banksmen will be in place to direct pedestrians accordingly. 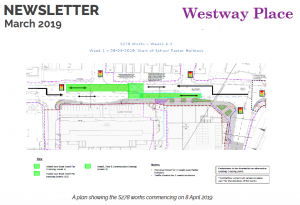 2) The section 278 works to form the permanent West Way pedestrian crossing will also commence on Monday 8th April as shown on the accompanying plan. As will be noted the current crossing will be closed and there will be a traffic light controlled vehicle contraflow system on West Way whilst the works take place. Although the plan indicates a 3 week programme the pedestrian crossing will be available for use from 23rd April to coincide with the reopening of the schools for the summer term. There is a map in the newsletter. They have apologised for the inconvenience these works will inevitably cause and noted that once complete no further works are planned for these 2 facilities. In addition, the Vale of White Horse District Council has released details of the addresses and numbering for all the buildings in the finished development. View the plan of the proposed numbering scheme.